We've talked in depth about many of the systematic changes and PC options in the blogs so far, but what about monsters? From animated objects to zombies, from the lowliest kobold to the mighty jabberwock, the Pathfinder Playtest Bestiary includes over 250 different monsters and other adversaries built specifically for the playtest. But what makes these monsters tick? We've worked to bring you many of your favorite Pathfinder monsters with their familiar feel and niche in the world, but with updated mechanics to make your encounters even more memorable! One of the monster innovations I—a computer science student at the time—appreciated most in Pathfinder First Edition was the idea of the Universal Monster Rule. It follows one of the most important principles of programming: modularity, which is to say, don't reinvent the wheel. One side effect of Universal Monster Rules having been a new concept in Pathfinder First Edition, however, is that many less fantastic creatures, especially animals, had a similar suite of Universal Monster Rules. For example, owlbears are iconic and memorable creatures, but as far as their statistics, if you look at the CR 4 owlbear and the CR 4 tiger side by side, the owlbear doesn't really have anything different to use during the encounter that the tiger doesn't. In the playtest version, those two monsters have some significantly different abilities. The tiger still has grab, allowing it to grapple a creature it hits with its jaws or claw attack, and the pounce action, allowing it to Stride and then Strike. Based on its real-world fighting style, it now also has wrestle, allowing it to claw a creature it's grabbed and knock it prone, and sneak attack, granting it extra damage against flat-footed creatures (typically ambushed via Stealth or those prone from its wrestle). Meanwhile, the owlbear also still has grab, but once it has you grabbed, it can gnaw on you, hoping to disembowel you so it can devour your guts and later regurgitate them to feed its young—and potentially making you sick from the disgusting sight. It can also unleash a blood-curdling screech as it advances into the fight to frighten you. In general, giving interesting new abilities to real-world animals like the tiger allowed us to do some fun research into the animals' habits and design from there. Animals that hunt in packs sometimes have abilities to deal extra damage in groups, ambush predators use sneak attack and various sneaky tactics, and so on. In Pathfinder First Edition, damage reduction (DR) and energy resistance both reduce damage by a set amount, the rarer vulnerability multiplies damage by 1.5, and immunity flat-out prevents certain abilities from functioning. Taken as a whole, monster defenses generally penalize you for using the wrong thing; you can deal your normal damage only by correctly bypassing DR, resistance, and immunities, and monsters rarely have a vulnerability. But in stories, we often imagine fey as being burned by cold iron or werewolves being poisoned by silver, and the reality of DR is that they just take the same damage from those as they do from cold, electricity, or fire. To fit those stories and to vary things up, we've combined DR and energy resistance into resistance, which reduces damage by a set amount, and we've changed vulnerability into a more common element called weakness, which increases damage by a set amount. Two great examples of how this can dramatically change the feel of monsters are skeletons and zombies. A level 0 skeleton has 14 AC, 6 HP, and since it's made of bone, resistance 5 to slashing and piercing damage. A level 0 zombie, on the other hand, has 11 AC, 20 HP, and weakness 5 to slashing damage. The zombie takes 5 extra damage every time it's hit by a slashing weapon—that's an extremely high weakness! This means the fights feel very different, even though the creatures both take about the same number of swings to bring down. You can test this out for yourself in Pathfinder First Edition right now: consider giving zombies some extra HP and changing their DR into a weakness instead and see how the feel of the fight shifts! Some monsters in Pathfinder First Edition have a large suite of abilities (typically from long lists of spell-like abilities), which vary between key iconic abilities, story abilities that influence what the monster can do in the narrative, and other abilities that are niche, redundant, or sometimes much weaker than their other attacks. For instance, it's pretty unlikely a nalfeshnee's call lightning is a good idea for a CR 14 monster to use in combat, and it doesn't have much of a noncombat application, either. In Pathfinder Second Edition, we tried to keep a monster's iconic abilities and story abilities while removing redundant or niche abilities, and then adding something new that fits the monster's ecology. For instance, barbed devils don't have the equivalent of order's wrath or unholy blight, but they have a special power called Warden of Erebus that lets them create extremely versatile glyphs of warding, cementing their role as, well, wardens of Erebus. For all such monsters, the goal is to make the monster's suite of abilities much easier to use and more memorable without oversimplifying the monsters, following our overall goal of adding as much depth to the game as possible while minimizing the cost in complexity. To close off, many people have been wondering how in the world we handle creatures with many heads, like the hydra, or arms, like the marilith or hekatonkheires, in the 3-action system. Such creatures have unique abilities to use their attacks in tandem in different ways. For instance, a marilith has three options for her six blades. She can make a focused assault on one enemy, which can deal a massive amount of damage on a hit, and deals damage for a single longsword even on a failure (but not a critical failure). Alternatively, she can spin about like a whirlwind of blades, attacking up to six different creatures with her swords. Finally, she can just attack twice and use the other blades to parry, giving her a killer AC for 1 round. That's it for monsters for today; tune in on Friday as Logan goes through an example monster in detail and shows how we made the statblock easier to reference! Hypothetically the flip side to that is that said succubus literally had divine intervention from a major deity to do so. On the other hand though, fallen good (and neutral) outsiders are dime a dozen without any deific interference so assuming the converse to be true is perfectly fine albeit with the caveat a bunch of demons are more likely to rip apart one of their own for edging toward weakness/good than a bunch of angels and evil. I keep hoping the final AP for PF1 is Nocticula's rise to become the goddess of outcasts and artists. I think the devs already vetoed that happening, at least in terms of PF1 APs. Cosmology is supposed to be the same in PF2 as it is in 1, at least on the outset. It also suggests that the "canon" ending for Wrath isn't going to have any ganked demon lords on a similar note. That said, I wouldn't be shocked if there's a PF2 AP about Noct's rise since JJ at least seemed to really like the idea. The Playtest FAQ and most of the information I've seen so far, has indicated that they are going to be updating the cannon. Nothing huge and world-changing like Time of Troubles or Spellplague or the abomination that happened between 3.5 and 4th edition. But they are going to be updating who's ruling what nation and give us canon outcomes of some APs and such. Like I said, I was speaking in terms of cosmology and deities rather than events in general. I think they've already said the Worldwound is going to be closed (but still a demon infested wasteland), various lost cities are off being explored, and Ravounel is off being not part of Cheliax and such. One thing I don't think I've seen addressed yet: can creatures finally have multiple types? Such as Fey Animal for a unicorn. I feel subtypes should mostly be reserved for stuff like (Fire) and (Devil). If "BAB" and the like are now pretty consistently based on level rather than type or class, it seems like a good opportunity to move to type combinations where appropriate. One thing that D&D 4E did well was separating "origin" from "type". In that system, for example, a unicorn would have been a "fey magical beast", with "fey" as the origin and "magical beast" as the type. Elves were "fey humanoids", in contrast to humans who were "natural humanoids" or genasi who were "elemental humanoids". It’s probably tags. I think the high-level Paladin option for wings also gave you celestial and angel? So instead of needing to specify “outsider with the evil subtype”, the rules can probably just use “fiend” as a rules term. I agree that this would be an improvement, but I doubt Paizo wants to move away from the "some races are innately eviler than others" shtick, especially judging by this right here. Well we have one example of a race moving away from that. Goblins. We have no examples on the other side. So I think that judgement is a bit premature. Goblins are an outlier and should not be counted. Golarion has at least one redeemed succubus. Devil, Evil, Fiend, Humanoid, Large, Lawful? If a demon can rise to become a servant of Desna, anything can. In regard to that, I have been toying with the idea that for Evil Outsiders to redeem themselves is merely very difficult, whereas surviving the transition is the hard part . . . .
Psh. The 'divine intervention' in that case was a few words of advice and something you could probably do with a limited wish (let an Outsider remember their mortal life). It wasn't the sort of thing that a mortal can do effort free, but none of it required a Goddess. A Goddess just happened to be the one who stepped in and did it. Reading this nd the stat block blog I've realised there is a new product I want from Paizo, and will happily pay money for - monster flashcards. I know pawns sort of fill this niche, but I avoid using them when minis are available, because the big pawns obscure sight lines on the battlemat. Being able to drop a picture on the table, or clip it to a GM screen and say 'it looks a bit like this' would be wonderful. ^This would also be awesome for people summoning monsters. Not really. You can almost certainly do the memory thing with a specific memory with modify memory and that's a level below the max level of effect limited wish can duplicate. Still, a real stickler might make it require an actual wish I suppose. Still within the scope of mortal means. Well, one of modify memory's explicit uses is "Allow the subject to recall with perfect clarity an event it actually experienced." Which sounds like exactly what happened. Doing it for a lifetime is certainly a bigger deal, but I wouldn't peg it as more than a 6th level spell ("Remove Amnesia" or the like), and messing with memories is well within the domain of Arcane Spells. On a mortal? Sure. On an outsider that has already transitioned from their petitioner status and into a full fledged outsider, who is basically no longer that person? Yeah, no. I mean, Desna had to reach into Aureshalae's soul and literally mess with that, which is beyond a simple modify memory spell. I mean we're talking a spell to turn not just some random joe, but a full fledged outsider, from CE to CN. That's not something you can just do. Besides, she obviously tweaked something else, because I don't see how making a CE Demon remember it's mortal life (which had to be a CE life for her to end up in the Abyss in the first place) would help redeem her at all. Which all just point sto "this is incredibly rare and almost never happens"
Uh...Arushalae's Alignment wasn't directly changed by what Desna did (indeed, there's no evidence a deity even can do that...if they could change people's alignment directly the setting would be pretty different and Desna wouldn't do that anyway, being a Goddess of Freedom). She explicitly then went and spent quite a while redeeming herself, which explains her going to CN from CE. Desna just pointed out the possibility and gave her some context (ie: memories). And remembering what being a human was like and comparing how awful and empty being a demon is could absolutely make even someone who was CE in life rethink their life choices and where they'd gotten them. Say that as a mortal she was in love with someone (hardly impossible or even unlikely, even for someone CE)...the realization that an actual relationship based on love and respect is basically impossible for a demon might be enough all on its own to start her on her path. And that's just one possible example out of many (though a likely one given that she's a succubus and falling in love is explicitly one of the things that aids her redemption). Another example is what if she had standards as a mortal? You can be CE and still think to yourself "I'll never harm a child. I may be a bad person, but I'm not that." and yet, when you become a demon you forget that decision and hurt and kill children along with the rest...what if you suddenly remembered? Wouldn't that be a certainty shaking experience, realizing that all your standards and justifications were nothing but self deception? Or maybe inspiring you to try and reclaim them? Now you can argue that modify memory couldn't give a demon back a mortal memory, but given that it can give false memories, never mind real ones from a previous incarnation, I'm skeptical of that claim. Giving them all back is definitely a step or three up from modify memory, and can be argued as above limited wish but definitely not a higher step than wish or miracle, so it's definitely within the scope of (very high level) mortal magics. It takes a very powerful artifact to retain mortal memories after the transition to petitioner/outsider, I very much doubt that a spell will allow you to dig up those memories once they've been wiped clean by your judgement and transition. I might let a Wish do it, but not because it's duplicating a spell. I mean, there's quite a lot of "ifs" there. For one, that her CE life was somehow different than her Succubus life; which is a big reach, considering that if she became a succubus, her life was probably one of complete uncaring hedonism where she just indulged herself without care for others. Otherwise she wouldn't have become a succubus. "Left to their own devices, larvae eventually transform into fullf ledged demons after a variable eternity spent crawling amid the gutters and filth, eating what the Abyss offers up and wallowing in their own noxious wastes, with the nature of each larva’s sins from its mortal life determining what manner of demon it eventually becomes." - Book of the Damned, Volume 2. For two, you're not digging up their memories. They aren't their memories anymore. They are not that mortal, they've cosmologically transitioned into an entirely new being. "On fantastically rare occasions, a particularly sinful or powerful mortal soul can even retain memories of its life on the Material Plane after its transformations from soul to larva to demon, but most souls lose themselves in the process, and are reborn in mind as well as body." - Book of the Damned, Vol 2.
modify memory at best lets you fake five minutes of someone's life per casting. To grab any outsider and make them remember not just a part, but the whole sum of the memeories of a life that isn't theirs anymore is way beyond the scope of limited wish. Maybe wish or miracle, but even then, getting their memories back means....well mostly nothing. Because we go back to the first if, that somehow the CE living person wouldn't enjoy their new CE demon life. Which might be true. Maybe. Especially for lower ranks of demons. But for the big dudes? I seriously doubt it. So yeah, Desna went in, fiddled with her soul, and probably that little whisper did something else too. I mean Auri became mythic that day too, is it really that hard to believe Desna did something more than just let her remember (which is already a big deal)? Also, if an artifact can change your alignment I'm pretty sure gods damn well could too. Why they don't do it is another question. But I'll admit, Desna didn't change Auri's alignment, just set her on a path to redemption. Does it? Someone who'd religiously used a mnemonic repository could do it with a single word and some time. That's admittedly not the normal case, and much more limited than giving one's whole memory back at once...but on the other hand, it's a CL 3rd item that costs only 3k. A high level spell doing more than that faster and better is rather to be expected. Heck, even the artifact you seem to be referencing (which can give anyone all of a creature's memories in theory, not simply return them to the person who had them originally...it's way more powerful than the effect being suggested) is only CL 15th (not the 17th you'd expect if wish was really necessary). I'm not saying this isn't a difficult thing to do, but then I don't think 7th level spells (or higher) grow on trees either. Despite its seeming to have a bad rep, I dig the 3rd Ed Book of Exalted Deeds, redeemed villains are cool, a LG Mindflayer Monk can't be all bad. It's possible to harm others with your lust and rapacity without being entirely without human connection. For example if you love a spouse but constantly cheat on them anyway, eventually driving them to suicide (or to murdering one of your lovers and then getting executed)...you have done an awful, awful thing (more awful for doing it to someone you loved), and may well wind up a succubus (if you were already CE), but that doesn't mean you didn't care about someone. Or how about a child? You can be an utterly terrible person and still care about your kid, or even kids in general. Oh, I agree. Most demons aren't gonna start a quest for redemption just because they get their memories back. Which ones do probably wouldn't actually be based on how powerful they are, IMO, but it'd be a tiny subset that'd even try. Those that got their memory back would likely get a bit...odd, by demonic standards, but most would still be very, very, Evil. Now, as for what magic it takes...that's actually almost academic to my main point which is that a sufficiently powerful and determined mortal could do it. I tend to think limited wish is enough because 6th level is about where I'd peg a 'Remove Amnesia' spell, but wish is also a possibility. Desna certainly made her Mythic. However, there's no evidence she did anything but return her memory and offer her advice and doing anything more is both really out of character for Desna (as a deity who cares about freedom), and cheapens any redemption (since then it really wouldn't have been her choice). A demon deciding to redeem themselves after recovering their memory is unusual, but she was weird even before the meeting with Desna (choosing to dream is a very weird thing for a demon to do), and Desna is a deity, her seeing that a memory recovery in this specific case might spark redemption seems much more likely than her forcing the issue with anything more overt. Mortal magic can actually do a lot of things Gods can't. Heck, Baba Yaga explicitly avoids becoming a deity specifically to avoid their limitations. I'd strongly suggest that Alignment changes fall under that category. The D&D 3.x Book of Exalted Deeds was a mixed bag. On the one hand, it presented a fair number of redeemed villains. On the other hand, some of the tactics presented in there, including at least one for redemption, seem like they were written by the CIA . . . .
Been trying to figure out how to do something like this for over a decade. I'm very, very close. Would very much like this to be an early option for 2e players. While I agree it could be a neat gimick - I'm not sure how much use I'd give something like that in play. Cards are great for things that are held by individuals over time - like conditions cards, item cards, etc. I'm not sure how I'd use monster cards. I mean, if the GM is the only one dealing with them, then why make them in individual form, instead of just the book (well - lets be realistic - the pdf or hero lab screen). I would LOVE those cards. They aren't for the GM, they're for the GM to show to the players. The mugshot, if you will, of what they're dealing with. Sure, if it's just a picture, I can sort of get it - but what was described I thought was cards with the statblock on them. ^Picture on one side, and stat block on the other (which conveniently is turned away from the players when you're showing them the picture, unless they're flanking you . . .). Well, if you just want to lay them flat on the table or clip them to a screen to show the art, the pawns already fill this role. You don't need to stick them in a stand, they are still physical embodiments of the monster art. Alternate use: Get a deck of several Monster Flash Cards, shuffle them, and deal them as random encounter generator. That's just the equivalent of a mental diary. I don't "have" someone's memories just because I reviewed a recording of them. That's not what I'm talking about. It's the Soul Anchor in Breaking the Bones of Hell (Hell's Rebels AP 6) created by a demigod that allows one who uses it during their mortal life to retain all of their memories and class levels after transition to a petitioner and outsider. A creature affected by the soul anchor gains no immediate benefit, but after death and judgment in Pharasma’s Boneyard, when the character’s soul is transformed into a petitioner, it retains some or all of its previous knowledge and class levels. These memories and levels are further retained should the petitioner later ascend and be transformed into a full outsider. The time it takes for these transformations to occur is not hastened by the soul anchor’s influence, and while being judged and sent on to the Great Beyond could take only a few seconds, in most cases it takes years or even centuries for the process to complete. The timing is left entirely to you to decide—but touching the soul anchor in no way guarantees a PC will be able to come back after death as a powerful outsider to finish out the Hell’s Rebels campaign. As a side note, the soul anchor’s effects are shed immediately should the mortal deliberately take his or her own life—suicide does not mix well with the soul anchor, and the soul of a creature that takes this route loses its memories and personality upon being judged as if it had never touched the soul anchor to begin with. Both devices you've cited record memories on a substrate separate from the soul. They don't prevent those memories from being washed away (and presumably unrecoverable from that point by normal means) by Pharasma's judgment. The soul anchor lets you keep Class Levels. That's a vastly more mechanically important concept than memories and absolutely justifies it being an artifact. On a conceptual level, it literally lets you cheat Pharasma's system and judgment (which is what normally determines what you become in the way of an Outsider). Hell, that would justify it being an artifact all on its own even if you still lost your memories. I don't think its existence says anything one way or the other about how difficult mortal memories are to return to a formerly mortal Outsider (which both the options I list actually do allow, both can make you live through the memories). I really like the "Monster for Every Season" pieces draw by Rich Berlew, of Order of the Stick fame. I'm still holding out hope that the new edition can involve Rich Berlew's art somehow, although I'm sure it is a little complex in terms of intellectual property and stuff. On different note, I really liked adding class levels to monsters. Sure, it could have some weird issues, and took some time, but you could really dial stuff in. I totally disagree with the idea that it was flawed because abilities from classes did not always synergize with the base creature. Not every aspect of a creature has to be CR appropriate. I feel that was a negative design trend of 4th Edition, that should not be continued. On different note, I really liked adding class levels to monsters. Sure, it could have some weird issues, and took some time, but you could really dial stuff in. Uh...all evidence is that you can absolutely do this in PF2. Even 'inappropriate' Classes will be more balanced, simply because any level of anything adds +1 to attack, saves, AC, all skills, and anything else with a Proficiency Bonus. But you can throw three levels of Cleric on an Ogre if you want and it looks like that would work fine. And regardless of proficiency level, everything gets + Level -2, right (Untrained)? Yes. Adding a level still adds +1 to such things (since 3-2=1 but 4-2=2), so that didn't seem necessary to note separately, at least to me. Hey, I wasn't having a go, just trying to get it straight in me ol' noggin. Oh, I wasn't trying to be snippy, just provide information and clarify why I hadn't mentioned it previously. Sorry if it came across otherwise. Tone is hard to convey properly on the internet sometimes. Totally, and this is why I specifically asked you, I consider myself pretty good at keeping up on new edition rules changes (tinkering before the edition has come out! ), and you are very on point, logging stuff, clarifying, etc, so it's like you're an unofficial little PF2 playtest guide, and the little part is not meant to be condescending, it's meant with endearment. I think this would be particularly cool for gargantuan creatures, which don't have pawns (at least in PF1). 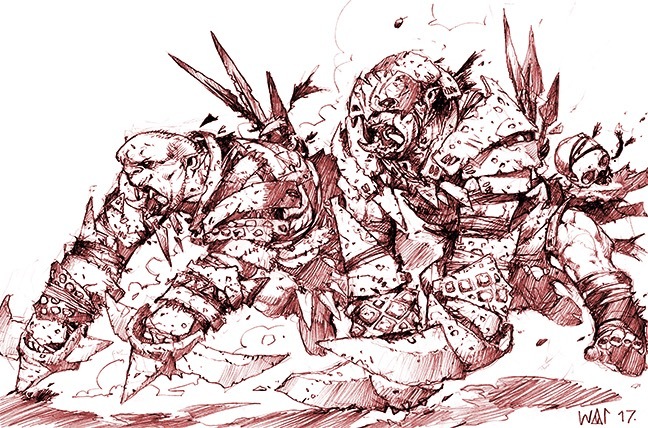 So this is maybe a weird question but will some monsters that were introduced in pathfinder 1st edition not be part of pathfinder second edition, what I mean is will they no longer be in the campaign setting? Not all will be statted, but they all exist, yeah. I can agree with this. Some things should have nasty abilities to make fights occasionally more interesting. I don't think I've ever seen deadman be snippy one of the reasons I gave him a cape! What's the over / under odds on website meltdown when 2E is released?